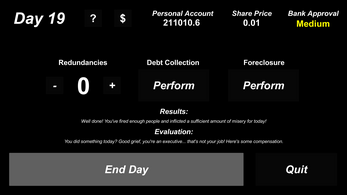 An economy prototype made for second year of the Game Design & Production course, Quid Pro: Bonus Bonanza is a satirical banking simulator and thinly-veiled social commentary to boot. 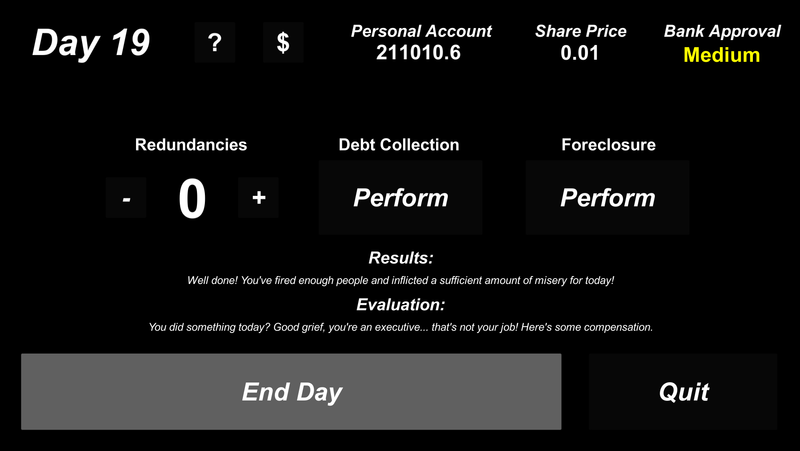 Part of a larger theoretical game, it also happens to be microtransaction-free so hopefully you get a chuckle out of this at least. If not, well... the bank absolves itself of any wrongdoing. If there any issues I've missed while testing, please let me know. Thanks for dropping by. Download the .zip folder and extract to a location of your choice. Open the folder, double click on the executable and you're good to go. Fullscreen and ultra quality recommended.